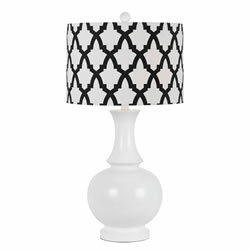 The Marrakesh table lamp features an exotic style fused with a modern design with its drum shade and white high gloss resin base. It's the perfect balance of sophistication and fun. This shade features rolled edges and nickle finish. No two are alike.